Post Chalcedon Oriental Orthodox saints. Topic: Post Chalcedon Oriental Orthodox saints. I thought it would be interesting to get a post started about post-OO saints, since I don't really know very many of them. Feel free to provide links and pictures of icons. Re: Post Chalcedon Oriental Orthodox saints. Abba Shenouda the Prophet and Archimandrite (the Head of the Anchorites) (d. 466, Abib 7th) lived before, during, and after the Council of Chalcedon. St. Shenouda is one of the greatest Saints of the Coptic Orthodox Church for a number of reasons. He is popular first and foremost for his transcendently profound asceticism and holiness which set him apart in the Church of his day to the extent that St. Cyril of Alexandria requested Abba Shenouda's company at the Ecumenical Council of Ephesus 431 for the primary sake of being accompanied by one of reputable holiness. When Abba Shenouda, and his disciple Abba Vesa sought to return to Egypt with St. Cyril, the sailors of the ship refused them entry. As the ship sailed, St. Cyril witnessed St. Shenouda and St. Vesa travelling upon a cloud, and cried out saying, "Bless us, O Father and Saint, O new Elijah!" Other unique incidents attesting to his sanctity include the prophetic witness to his birth by St. Athanasius and a monk of the Pachomian order known as St. Horesios who, upon meeting St. Shenouda's mother before St. Shenouda's birth, announced: "God bless the fruit of your womb, who will be like Amber diffusing its sweet aroma throughout the whole world". His position as Archimandrite and Abbot of the White Monastery were also prophetically witnessed. Upon visiting St. Pijol at the White Monastery as a child, St. Shenouda's father, who accompanied him, requested that St. Pijol, the Abbott of the White Monastery, bless his son. Abba Pijol refused and instead took the hand of St. Shenouda and placed it on his own head saying, "It is I who is in need of this boy's blessing, for he is a chosen vessel of Christ, who will serve Him faithfully throughout his whole life". St. Shenouda's childhood as a shepherd itself evidenced exemplary Sainthood; however, I shall leave the story of his childhood to the below links. Saint Abba Shenouda eventually succeeded St. Abba Pijol as head of the White Monastery in the year 383 A.D. In contrast to St. Pachomious who regarded coenobitism to be the climax of monastic excellency, St. Shenouda promoted, in the practice of his monastic community, the concept of coenobitism as the means of preparing spiritually mature souls for the life of anchoritism. St. Shenouda also acquired popularity, particularly within the Coptic Orthodox Church, on account of his socio-political activities. Abba Shenouda and the thousands of monastics under his rule did not sever themselves completely and unconditionally from the social issues that affected the nearby communities, but rather, in the true spirit of Agape Love which transcends the letter of Monastic canons and regulations, shared the sufferings of the wider Body of Christ and pursued practical means by which to assist the wider community. Thus, during the Blemmye invasion of Upper Egypt, the monastery opened its doors to the refugees and captives, providing not only spriritual comfort and divine protection, but also medical assistance to the wounded, and food to the many in hunger. Many miracles we performed at the hands of St. Shenouda during this time, including the multiplication of food to feed the many who required it. In spite of his zealous pursuit of the hermitic life, St. Shenouda also took up the position of advocate on behalf of the oppressed Copts during the disastrous aftermath of Chalcedon. He rigorously took up the cause of the Coptic peasants forced into slavery under Byantine rule, both in the courts and before the Emperor himself. In his Spirit-led pursuit to maintain the integrity of the Orthodox spirit amongst the Copts, he helped shape and establish Coptic identity against Byzantine influence in the aftermath of Chalcedon, particularly through his most valuable contribution to Coptic literature. P.S. I will try and update this thread weekly; thanks for your interest. His father...owned a small flock of sheep for which he employed a shepherd. This shepherd...asked the parents to have the young St. Shenouda help him in taking care of the sheep. For such assistance, he would have them deduct a fee from his wages. This afforded our young saint the opportunity to be trained in the profession of the saints...The early signs of his spiritual growth were manifested to that shepherd one night, when he saw him raising his hands in prayer in the well with his fingers resembling ten luminous candles. In recent memory we hear of a monk in St. Paul's [the first Anchorite] Monastery near the Red Sea in Egypt, who exhibited such phenomenon during prayer, i.e. luminous fingers! Ever since the incident where Abouna Fanous's hands were illuminated during prayer for all to see, he scarcely leaves his cell (in fact he didn't leave his cell for approximately 6 months after the incident). Now, when he is compelled to leave his cell, he never leaves without wearing thick socks on his hands (as you can see in the above photo). ...and Abona Fanous does not open his eyes as well because the pupils illuminate as a cross and he always looks to the floor. One of the few who according to worldly standards are despised and unappreciated but the earth does not deserve him. I love the Coptic icons. I hope you will add more! On this day, the 30th of the blessed Coptic month of Tubah, in the year 1723 A.M. (1988 A.D.), the holy St. Andrew the Samuelite of the Monastery of St. Samuel the Confessor departed to join the ranks of the victorious. St. Takla Haimanot of Ethiopia ought to be mentioned as it would surprise me if the deeds of this great saint were not known amongst the Eastern Orthodox also. This saint stood in prayer for so long that his leg fell off and it is said that it is burried under the place where the Ark of the Covenant now rests in the Church of St. Mary of Zion in Axum. St. Tekla Haymanot also began performing miracles when he was only a small boy and his faith was always exceedingly great. May he please pray for us weak sinners. Would somebody with greater knowledge of this saint care to speak more of him please? Thank you. He last settled in the land of "Shawiry" where he built his well-known monastery known as "Elbianos". Many people followed him and became Monks. He exerted a lot of effort in praying and fasting and kneeling before God. He even used to pray standing on one foot; the right one, until his leg was broken! His monks took it and covered it. He never got out of his cave, but remained there till his death. This Saint has left the church blessed with his love for deep fervent prayer and fasting. May we all learn to prayer and fast like this Saint. He was the only human being on earth given wings. Thus his Icon always shows him with wings and standing on one leg with hands up and out in prayer. The priests in the Ethiopian Church during the opening liturgical prayer we call it "Ahadu" stands in front of the Holy Alter with his hands up and out in a stance of St. Tekle Haymonot and slowly prays "one is the Holy Father, one is the Holy Son , one is the Holy Spirit...." The priest seems as if he is going to fly away. It is a powerful thing to experience. This Ethiopain Saint is revered and venerated greatly among our Coptic brothers and sisters. I shamefully must say maybe more than in Ethiopia. WE love him deeply; he is a special Saint for the whole universal church worldwide. However; it seems that my Coptic family has many churches, monastaries, books, videos etc. on our beloved Saint. I had a hard time finding and Ethiopian traditional Icon for this posting. I keep a Coptic traditional Icon of this great saint in my car. 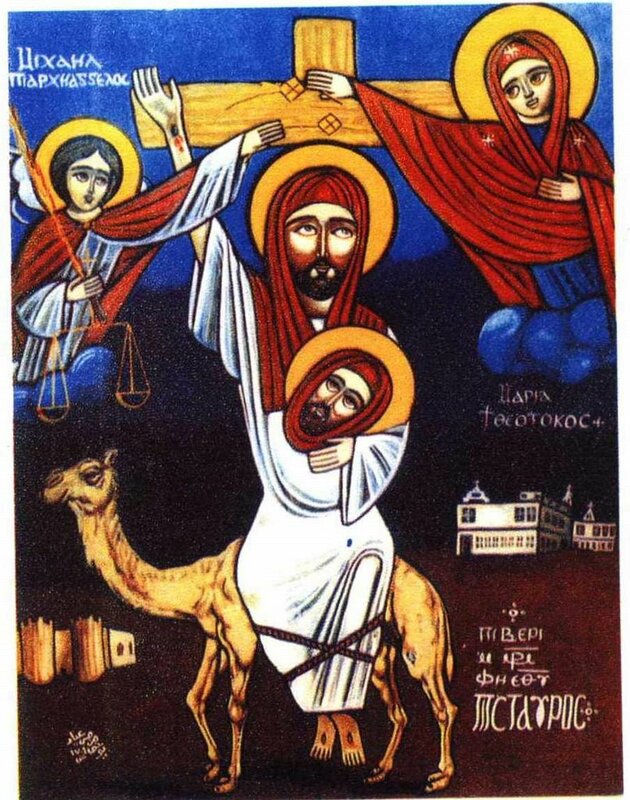 Even this Icon was given to me by a very dear Coptic sister who I worked with almost 15 years ago. I put it in my car that hot afternoon on my way home that day and have just moved it from car to car ever since. I feel that I am being protected by the wings of St Tekla Haymonot instead of the "wings of GoodYear" so I intend to leave it in all my cars that the Lord allows me to have. Thank you Magda and God bless you where ever you are!!! On Monday 3rd of the month of Kiahk in the year 1229 A.M. (1512 A.D.), the victorious St. Salib (Pi-Stavros) the New Martyr received the glorious crown of Martyrdom. Increased conversions were primarily inspired by fear from the threat of violence and the severe restrictions placed upon Non-Muslims at the time. Amidst this great age of apostasy, St. Salib shone as a beacon of courageous strength and uncompromising fidelity to the Truth. From an early age St. Salib’s spirit sought after the heavenly life to the extent that he refused to even sleep with his own wife whom his parents had, in the absence of his consent and contrary to his own desires, arranged him to marry. Having secured the physical purity of his body, St. Salib desired to further sanctify it in his own blood which he sought to shed for the Name of Christ. Consequently, St. Salib was imprisoned for the night in order that he may be sent to Cairo the next morning to be dealt with by the Sultan. During his stay in prison, the prison officer witnessed an illuminated lady releasing St. Salib from his chains and relaying the message that his earnest desire to die for the Lord had been granted to him. Undoubtedly, the lady in question was none other than Our Lady, the Theotokos St. Mary. Upon witnessing this event, the prison officer believed in the Faith of St. Salib and offered to release him that he may escape. St. Salib, being passionately focused on Martyrdom, remained unmoved by the offer and ultimately rejected it. The next day, on his boat trip from upper Egypt to Cairo, the Muslim officer in charge of the boat likewise witnessed St. Salib conversing with the Virgin Mary and the Archangel Michael also; moved by the experience, the officer presented St. Salib with yet another opportunity to escape his fate, which was yet again refused by the determined hero of the Faith. St. Salib’s punishment was thus ordered: he was to be nailed onto a wooden cross and then mounted on a camel to be paraded in the streets of Cairo. The aim and the intent of the Muslims was clear: to humiliate both St. Salib and the symbol of his Faith (and subject of his name)—the Holy Cross; nevertheless, behind the scenes of the distorted reality of the Muslims, the Cross and the one bearing its Holy Name were being exalted through humiliation and glorified through suffering. St. Salib was then taken down from the cross to be finally executed by beheading. Amazingly, the magistrate gave St. salib yet another opportunity to renounce his previous remarks and to embrace Islam; needless to say, St. Salib denied the magistrate’s offer and was consequently executed, whereupon St. Mary embraced his soul in sheets of light and presented it to her beloved Son. St. Salib’s body was then taken to be burnt, whereupon and by virtue of divine protection, St. Salib's body withstood the flames of the furnace for three days. A group of faithful Christians under divine guidance pursued the Saint's body and brought it to the Church where it became a source of numerous miracles and healings. May his prayers be with us all, and Glory be to God Forever, Amen. The following account is based on the Martyrology of St. Salib (Coptic Museum manuscript, MS Tarikh, 475) as summarised and analysed by F. Armanios and B. Ergene in 'A Christian Martyr Under Malmuk Justice', The Muslim World Vol. 96 Issue 1 Page 115 January 2006. A unique historical point to make in regard to the hagiographical account of St. Salib, which would certainly be of interest to scholars of hagiography, is the fact that essential facts are corroborated by an independent Islamic source: Ibn Iyas’ chronicle titled Badai al-Zuhur fi Waqaial-Duhur. The two accounts differ only in respect of their interpretation of the essential facts in question. “The Non-Muslim Communities: Christian Communities,” The Cambridge History of Egypt I: Islamic Egypt From the Arab Invasion to the Ottoman Conquest (641–1517), ed. Carl F. Petry (Cambridge: Cambridge University Press, 1998), p. 184. In contrast to the Balkan martyrologies, the presumption in St. Salib’s martyrology is that he actually committed the crimes in question, in contrast to the Balkan accounts where most martyrs are falsely accused of insulting Islam or of blaspheming Muhammad, or even tricked into publicly professing their faith in Christ. Coptic: Hiten ni evki ente piveri em-marteeros pi-athloforos fi-ethooab pi-estavros, ep-chois ari ehmot nan empiko evol ente nenovi. English: Through the prayers of the New Martyr, the Victorious, the Holy Saint Salib, O Lord grant us the forgiveness of our sins. The Departure of St. Abba Abraam, Ebn-Zaraa, 62nd Pope of Alexandria. On this day, the 6th of Kiahk of the year 970 A.D., the saint Anba Abraam, the 62nd Pope of Alexandria, departed. This father was a descendant of the Christians of the East; his name was Ebn-Zaraa the Syrian. He was a rich merchant who often visited Egypt, and finally settled there. He was blessed with many virtues, including mercy to the needy. His reputation for righteousness and knowledge was quickly and widely spread. When the Patriarchal Chair became vacant, the bishops and the learned elders all agreed to choose him as Patriarch. When he sat on the chair of the See of St. Mark, he gave all his possessions to the poor and needy. They set all their concubines free and went to the Patriarch repenting, except for one of the rich men of the country. This man did not fear God nor did he heed the fact that this father, who chided him repeatedly and was very patient with him, would excommunicate him. He did not return from his evil way and was not afraid lest God should destroy him. In spite of that, this father did not slacken in teaching and rebuking him. Furthermore he humbled himself like Christ, his Teacher, and went to that man's house. When the man heard of the arrival of the Patriarch at his house, he shut the door and refused to let him in. The father remained standing at the door for two hours knocking but the man neither opened the door for him, nor did he speak to him. The father realized that this wretched man had intentionally separated himself from the flock of Christ and became a corrupt member. The Pope saw it fit to cut him from the body of the church, that the rest of the body may be preserved from his corruption. He excommunicated him saying, "Let his blood be on his own head," and then the Pope shook off the dust from his sandals at the door of the house of that man. At this moment God manifested a sign before the eyes of those who were present, for the doorstep, which was made of granite, had split into two. Later on, the Lord showed his might, and the man lost all his wealth and he was fired from his position in disgrace. He became ill, which led to his death in a horrible way. He became an example to the others; since many sinners learned a lesson and were afraid as a result of what happened to him. Abba Abraam came along with Anba Severus Ebn-EI-Mukafaa, Bishop of Ashmunein. El-Mu'izz ordered them to sit, so they sat down silently. He asked, "Why are you not debating?" Anba Severus answered, "How can we argue in the presence of El-Khalifa, with a man who is less intelligent than an ox?" El-Mu'izz asked for an explanation. Anba Severus said, "God has declared by the mouth of the prophet, 'The ox knows its owner, and the donkey its master's crib: but Israel does not know."' (Isaiah 1:3) They debated the Jew and shamed him with irrefutable arguments proving the soundness of the Christian faith, and they left El-Mu'izz with great honor. A few days later, the Jewish Vizier; Jacob-Ebn-Yousef went to El-Mu'izz and maliciously told him, "Your royal highness knows that the faith of the Christians does not have a sound base. Their Bible states, 'If you have faith as a mustard seed, you shall say to this mountain, move from here to there, and it will move.' (Matthew 17:20) Prince of the faithful knows the falsehood of these sayings. And to verify this, we will summon the Patriarch to give us the proof that their Christ's sayings are true." The Khalifa thought to himself, "If the saying of Christ is true, that would be of great benefit to us, for the Mukatam mount is too close to Cairo. If the mountain can be moved away, that would make the position of the city greater than what it is now. If the saying is not true, that will give us justification to persecute the Christians." The father, the Patriarch, and the believers prayed and prostrated three times, and every time they prostrated, they cried out saying, "Kirie-Eleison" (Lord have mercy). Whenever the Patriarch and the congregation lifted up their heads after each prostration, the mountain would lift up and when they bow down, the mountain was lowered down to the ground, and whenever they walked, the mountain moved before them. A great fear came on the Khalifa and his companions and many fell on the ground. The Khalifa advanced on his horse toward the Patriarch and said, "O great teacher, I now know that you are a holy man, ask whatsoever you wish and I will give it to you." The Patriarch refused to ask for anything; but when the Khalifa insisted, he asked the Governor to allow him to build churches, especially the church of St. Mercurius (of the two swords) which was in Old Cairo. He wrote him a decree permitting the building and the renovation of churches and he gave him a large sum of money from the treasury. The Patriarch thanked him and prayed for him, but he refused to take the money. As a result, El-Mu'izz revered and respected him more for his piety and righteousness. When they started building the church of St. Mercurius, some evil men prevented them from working, whereupon El-Mu'izz came to the site and kept the troublemakers away. He remained there, standing until they completed laying the foundation. Today we commemorate the departure of St Samuel the Confessor (7th century). I won't post his Synaxarium account here since it may be viewed as polemical (his refusal to endorse the Tome of Leo marks one of the highlights of his life). St Samuel is widely remembered for his steadfast faith in the face of persecution. After being forced into exile by the Chalcedonian authorities, St Samuel was visited by an Angel of the Lord who commanded him to go to the Mountain of Qalamoun where he established a monastery. Afterwards he was taken captive by berbers who attempted to have him worship the sun; they also tried to defile his purity by tying him up with a maiden to tempt him to fall into sin with her. After miraculously healing the son of the head of the berbers he was released back to his monastery whereupon the Theotokos appeared to him and declared that his monastery would be her abode forever; from that day forward the monastery did not face any subsequent attack from the berbers (the monastery furthermore remains in existence till this day, under his name). St Samuel is also widely remembered for prophesying of the Arab invasion and of the age of apostasy and laxness that would befall Christians as a result of their abandoning their Coptic heritage under foreign influence. As a young child, St. Vahan was taken into custody with many other children of Armenian nobility who had been killed because of their Christian belief. He was taken to Damascus where he was taught, together with other children, the Islamic faith. He was well liked by the Arab leaders and attained a high position in the court. While serving in court, the Arab overlords granted the Armenian children, who had grown to adulthood, the right to return home. St. Vahan promised his overlord that he would return but, after returning to Armenia, his overlord died and St. Vahan felt he was released from his promise. St. Vahan married and established himself over the lands of his father who was killed prior to his captivity. The Arab overlords, however, demanded St. Vahan's return and started to pursue him. He fled from place to place for many years, leaving his family and home. At each place he went, the people became endangered because of his presence so he finally decided to surrender himself, explain his desire to remain in Armenia, and practice his own religion. The policeman governing Armenia had him immediately thrown into prison and, after many different kinds of torture, he was finally beheaded. His life and martyrdom were recorded and, according to some traditions, the melody and lyric of the sharagans dedicated to this saint were written by his sister. While Abba Isaac, the head of El-Qalamun monastery (the monastery of St Samuel the Confessor), was sitting in the monastery a young man came to him. Abba Isaac made the sign of the cross over his face as is the custom of the monks and allowed him to draw near. The young man came closer and prostrated himself before the saint and told him, "My father, Abba Isaac, accept my weakness for the sake of the Lord Christ. Help me to save my soul and count me among your children." The abbot marvelled, for he called him by his name and asked him, "Who told you of my name?" The young man replied, "The grace that dwells within you informed me." The abbot asked Misaeal to sit down and he told him, "May God Almighty make you a holy temple. And now tell me about yourself." The young man replied, "My name is Misaeal. My father loved the world which kept him from worshipping God; he was also sorrowful for he did not have children. One day he hosted a holy old monk and expressed to him his sorrow for not having a child to inherit his wealth. The monk told him, 'Reform your way with the Lord, the Lover of mankind, and He will give you a blessed son.' He asked the monk, 'How can I go about doing that?' The holy old monk replied, 'Live a perfect life and live according to the commandments of the Church that are required of the believers; do not stay away from the Holy Church and have a priest to consult with in all your affairs. If you do that, you and your wife will have what you wish.'" St. Misaeal said, "My father did all that the holy old monk commanded, and his words were fulfilled and my mother gave birth to a son, me." "When I was six years old, my parents departed. The father, the bishop, took care of raising me, he also took care of my education and of managing my money. When I studied the Scripture, I longed for the monastic life, so I came here." The abbot was pleased as a result of what the young man, Misaeal, told him. He entrusted him to one of the elders in the monastery who trained him in asceticism, in worship and in the battle of the spiritual life. Afterwards, they clothed him with the garb of the monastic life and the holy Eskeem. From there on, he lived a solitary life in worship and asceticism. One day, one of the brothers in the monastery came to Abba Misaeal. They prayed together, blessed each other and sat discussing ways to overcome the evil enemy. St. Misaeal told him, "The devil flees when our spiritual prayers are sincere and heartfelt." After they ended their spiritual talk, they praised God and the brother left him. After a while that brother came to Abba Misaeal and found him praying saying, "O Lord save me, look upon my meekness; wash me of my iniquities, for my mother and father have forsaken me but You O Lord adopted and accepted me." When the brother noticed how thin he was, for his skin cleaved to his bones, he cried and told Abba Miseael, "Your body looks like it has been burnt." The saint told him, "I thank my God for he has given me my eyesight and my hearing to read the Scriptures and hear the word of God and he also gave me the strength to stand as I pray." The abbot listened to what the saint said and he bought much of the grain. As St. Misaeal predicted, the famine took place and wheat was in shortage. The Governor came with his men to take whatever grains he might find in the monastery. Soldiers appeared and prevented the governor from doing so and the governor went back empty handed. The abbot welcomed those soldiers, thanked them and offered them food to eat. They told him, "We are not in need of any of that food." One of the them came forward, took the abbot's hand, and took him aside and told him, "Abba, I am your son Misaeal and those people who look like soldiers are hermits who came last year and took me with them. I ask you now to go to Abba Athanasius, the bishop of my town where I was raised; tell him about me, and ask him for my father's money with which you should build a church in my name. Then call our father, the bishop, to consecrate it." The abbot did as St. Misaeal asked. He went to the bishop and took the gold, the silver, many books and 500 heads of sheep from him. Besides, he also received fabrics, jewels and utensils that belonged to the saint. The abbot tore down the saint's old house, bought the land next to the house and built the church there. While the father, the Bishop, was celebrating the consecration of the church, St. Misaeal and the fathers, the hermits, came and attended the consecration prayers. St. Misaeal told the abbot of the monastery, Abba Isaac, that he would depart from this world in the following year. Then they went back to from whence they came. In another incident Satan sent robbers to the windmill. The robbers beat Father Mina and injured his head. When Father Mina regained consciousness, he noticed he was bleeding. He crawled to the icon of Saint Mina and put the icon on his head. The bleeding stopped at once. Father Mina then went to the hospital to be treated. The doctors were surprised when they found out that he walked 15 miles from the windmill. A Short life history of martybishop Abune Petros who became martyr on the 29 th of July 1936, in Addis Ababa Ethiopia in the struggle against colonialism and oppression. Abune Petros was born 1982 in a farmer family in the city of Fiche, which is situated north of Addis Ababa. He got the baptismal name Hailemariam that means power of Maria. As the custom of the Ethiopian Orthodox Church (EOC) tradition he got a special bishop name, that is PETROS with the Ethiopia title for a bishop which is ABUNE. As a young boy Abune Petros was known as clever, helpful and humble disciple in the city and the church in Fiche. He chose early to study the EOC diakon and priest education. At the age of 24 he took the EOC oath and became a monk. He grew up and became a principled and well-known teacher around the monasteries in Fiche and Wolamo area. In 1918 he was assigned by the EOC as he teacher and priest for the Debre-Menkrat monastery church in the region of Wolamo. Abune Petros continued to teach there when in 1924 he was assigned as the main teacher for the well-known island monastery-church of Mary, which is situated inside Lake Zewai in southern part of Ethiopia. He was well known for his teaching and preaching to the people around the region to seek first the kingdom of God: "To put on a heart of compassion, kindness, humility, gentleness and patience." (Colossians 3:12). His teachings and preaching were very popular and insightful to the people in the area and the disciples he teaches in the Monastery. In 1928 in connection with the nomination pf Ethiopia bishops in the St.Marks Monastery in Alexandria, he was nominated to one of four bishops of Ethiopia, with the title and name ABUNE PETROS. Abune Petros was nominated as bishop of the central and eastern part of Ethiopia. Half of his time he stayed in the City of Dessie and the surrounding monasteries, while he rest of his time he spent visiting and teaching in he monasteries around the Wereilu region. To help him in the administration of the churches and monasteries in the two regions, two priests were assigned to him one from each region. He continued to preach the gospel and teach in the churches. He was liked by many for his teaching and exhortation to stand-up for the belief, the truth and follow the example of our lord Jesus Christ: "For to you it has been granted for Christ's sake, not only to believe in Him but also to suffer for His sake." (Phillippians 1:29). As we read further we will see that Abune Petros exemplified this with his life. When Italy with the leadership of fascist Mussolini's army invaded Ethiopia in 1932, Abune Peteros followed with Emperor Haile Selassie and the Ethiopian defence forces to the northern front. He helped the wounded, prayed and consecrated the dead and preached the Gospel. During that time he saw the undiscerning terror and violence of the invading army: He saw how the invading army with the help of nerve gas and technologically advanced weaponry burned down the forest and villages with innocent civilians and at last won the war at Maichew. The patriots retreated and decided to continue guerrilla warfare against the fascist army. Abune Peteros, with all the impressions he got from the war and the burned villages of civilians, returned safely and took refuge in the well-known monastery church of Debre Libanos. In the monastery he urged the priests and monks to fast. He himself started to fast and prmy for the mercy of God to the people of Ethiopia and prepared himself for the big challenge that is waiting a head for him: "My earnest expectation and hope, is that I will not be put to shame in anything but my lord Jesus Christ will even now as always be exalted in my body, whether by life or by death." (Phillippians 1:20). During these difficult times he started to question in his preaching. "How a Christian country as Italy could undertake such a hideous terror action of occupation on another peaceful Christian country that is Ethiopia. "For him all Christians were brother and sister pilgrims helping each other in this world on the way to meet God in Heaven. With that he began his crusade against the invading army's terror and killing machinery. He went further and condemned all the violent actions and killings of civilians by the invading army. The fascist army was by then committing undiscerning violent actions against innocent civilians because they had suspicion that the people are helping the patriots who were growing in both strength and manpower. During these times there were some EOC priests who out of fear of the terror of the army accepted the Italian leadership in Addis Ababa. Through these priests the fascist army sent letters to win the support of the popular and respected bishop Abune Petros to its camp, to accept the powerful army of Italy as government and stop with his preaching against the violence of the army on civilians and the patriots. If he did this they promised him the best house quarters and a peaceful life in Addis Ababa. Abune Petros saw these letters as a incitement of commit sin against God, his Christian belief and consciousness. With that he refused to accept the offer and stayed in fasting and prayer in the monastery of Debre-Libanos. "Choosing rather to endure ill-treatment with the people of God that to enjoy the passing pleasures of sin" (Hebrews 11:25). The resistance against the encroachment and violence of the invading army kept on growing like wild fire over the whole of Ethiopia. The patriots began to win battles at different fronts. Abune Petros continued his teachings and preaching to the people to stand-up for their belief and conviction and that God would visit the downtrodden people of Ethiopia soon. He went on further and preached against Italy's right to occupy Ethiopia with terror and violence. He exhorted the people not to be afraid of the terror and violence from the occupying army. "I say to you, my friends, do not be afraid of those who kill the body and after that have no more that they can do. But I will warm you whom to fear: fear the one who has the power to kill the body and after that has the authority to cast in to hell; yes I tell you fear Him." (Luke 12:4-5). The Italian authorities in Addis Ababa who saw and heard him preach wanted by all means to stop Abune Petros from preaching and inciting people to resistance. However, since he was very popular and respected bishop, many in the Italian authorities would rather win his support to accept the Italian authority in Ethiopia than imprisoning or killing him. In the month of July 1936, the patriots planned and executed an attack on Addis Ababa. During that time one of the day Abune Petros clothed with his bishop garment and the ever - present hand cross rapped in a small blue scarlet cloth went into the capital city and began to preach to the people who were lamenting in the grips of the invading army. The soldiers were given order to arrest the Abune and bring him to court for treason against the Italian occupation. While he was in prison waiting for court appearance, both the priests in the city and the officers of Italy tried to convince him to accept the Italian occupation. And finally have him the following ultimatum: To stop preaching against the occupying army's violence and terror against civilians and the patriots, accept the Italian authorities in Addis Ababa and finally condemn the patriots as bandits. Otherwise, he was told that he will lose his life. Abune Petros refused to comply to the ultimatum set by his tormentors and through the(Italian) interpreter gave the following answer to the interrogating officers of the invading army: "The cry of my country men who died due to your nerve-gas and terror machinery will never allow my conscious to accept your ultimatum. How can I see my God if I give blind eye to such a crime." Listen to me you who know righteousness, a people in whose heart is my law, do not fear the reproach of man, nor be dismayed at their revilings. For the moth will eat them like garment....." (Isaiah 51:7-8). "Blessed are those who are persecuted for the sake of righteousness, for theirs is the kingdom of heaven." (Matthew 5:10). After this a quick assembled court sentenced Abune Petros to death. The news of the death sentence on the popular bishop of Ethiopia spread over he whole country. People begin coming to Addis to say farewell of their beloved bishop who stoop-up for the righteous cause which God have called him, for the right of the people of Ethiopia to freedom and independence and against the terror and violence of the invading army. All this form the pulpit of a church and it the presence of deadly ultimatum upon his head. Due to his popularity the fascist army was afraid of riot and attempts by the patriots to free him from prison, and decided that the execution of the death penalty should be done as soon as possible. He was taken to his execution place where a many people and the fascist army officers and generals were gathered, and were told to say his last speech. We cite the Ethiopia Orthodox Church newspaper Vol.1,No. 8,9,10,1945 for the account: " When Abune Petros came to the place of execution and was given to say his last words, he took his hand cross and removed the blue cloth that was rapped around it and blessed the people at the four corners of the world and said the following last words: "My country men don not believe if they tell you that the patriots are bandits, the patriots are people who yearn for freedom form the terrors of fascism. Bandits are the soldiers who are standing in front of me and you, who come from afar, terrors and violently occupy a weak and peaceful country: our Ethiopia. May God give he people of Ethiopia the strength to resist and never bow down to the fascist army and its violence. May the Ethiopian earth never accept the invading army's rule." After that a swarm of bullets from the execution platoon pierced and killed our beloved bishop Abune Petros. The fascist army wanted by any means to cover up the crime they did against Abune Petros and Ethiopia by forbidding everybody all writings about his execution. Because of his popularity both inside and outside of Ethiopia they thought it might injure their policy of occupying Ethiopia due to the domestic and international opinion that grew against his act. However hard they tired to stop the publicity, the example of Abune Petros shines in all people who love the truth unto this day. Above all, the fascist army's lost all credibility from the domestic opinion, many found courage after this to leave the occupying army's stronghold in the capital city to join the patriots and fight for independence. patriotic resistance grew more in strength and lead o a sooner freedom of the country from the fascist occupation. The poplar Ethiopian Poet-Laureate Tsegaye Gebremedhin has illustrated the last days of Abune Petros life by a theatre play called: "Petros at that Hour". A statue of Abune Petros was raised in the capital city Addis Ababa 10 years after his death, as a reminder to coming generations of: his unwavering stand for the truth. His unbending courage to stand up against every form of violence on human rights, his integrity and his commitment not to give in for short term gain or treat. Above all his unwavering conviction and belief that we all one day will sand up and answer for our deeds in his life before God. Abouna Yostos El-Antony, is a great saint of the Coptic Church who departed to be amongst Christ and the Saints in 1976. A movie on his life was produced, and can be viewed online at the below links. It's in arabic, but it has english subtitles. A Persian by birth from the Rajig family, Krikoris was originally named Manjihr. At a very young age, he moved to Armenia and adopted the Christian faith and his new name. Krikoris entered a monastery near Tvin and was so renowned for his piety and strong faith that the monastery was eventually named Rajig Manjihr. When the Persian Marspan Tenshabouh started his reign over Armenia, he spent much time and effort spreading the Persian religion and was particularly concerned with Krikoris. Finally, he ordered Krikoris to return to Persia. Krikoris refused whereupon he was tortured and finally beheaded. One of the most obvious and most popular post schism Oriental Orthodox saints among our Eastern Orthodox brethren is St. Isaac of Syria. Many websites carry his Icon and I'm sure his works are available online also. St. Isaac of Syria was in the Nestorian communion, actually. As for Berbers, that's a North African ethnic group. St. Augustine was one. Not all of them are tree worshippers. St. Isaac was in the Nestorian communion but he is venerated in the Eastern and Oriental Orthodox Churches I believe. I'm sure his works are available online also. Yes, St. Isaac of Syria Skete carries some of his works. Born Sourhan of a Persian father and a Christian mother, he entered military service of the Arab overlords at a very young age and was assigned to Armenia, where he served side by side with the Armenian prince Krikor Mamigonian. He accepted the Christian faith and was baptized by Catholicos Nerses the Builder and renamed Tavit. He lived many years in peace and made his home near the Armenian capital, Tvin. When Abdulla Vostigan became overlord of Armenia, he started a series of persecution against the Christians. Tavit, a former follower of Islam, was among the first to be arrested. When he refused to change his religion, he was crucified and speared upon the cross, when he was sixty years of age. His body was buried near the Mother Church of Tvin and the cross and spear used to martyr him were kept in the church. At the turn of the 20th century, there lived a holy man on a haunted island, called Parumala, on the banks of River Pampa in Kerala, India. He was the prophet of his time, who set moral tone for his people. Powerful like Prophet Elijah and glittering like John the Baptist, he remains the beacon and a great Saint of the Malankara Orthodox Church. It was on June 15, 1848, that Kochu Ipeora(Geevarghese) was born in Chathuruthy family, Mulanthuruthy, Kerala. His parents were Kochu Mathai and Mariam, who had three sons and two daughters. After the birth of fifth child Ipeora, Mariam died. After the early days of education under Malpan(teacher) Geevarghese of Chathuruthy, Kochu Ipeora was ordained as decon on September 14, 1859; he was only ten years old at that time. One day Malpan became seriously ill with smallpox. Deacon Geevarghese was the only one who stayed and took care of him, while all others were sent home. On the eight day Malpan died and Deacon became ill. During this time he had a vision of St. Mary in his dream, descending to console him, and exhorting him to dedicate the rest of his life to the lord. He pledged: "He Would". This was a heavenly vision that enable him to become a humble servent of God. Very soon the deacon recovered. At the age of 18, in 1865 he was ordained as a priest. Joseph Mar Dionysios raised him to the order of monks(Ramban) in 1872. The Patriarch of Antioch consecrated four(4) metropolitans at Paravoor Church, Kerala in december 10, 1876. The youngest amoung them was Geevarghese Ramban and who was named Mar Gregorios. Because of his age everybody called him "Kochu Thirumeni"(Youngest Bishop). Mar Gregorios was appointed the bishop of Niranam, Kerala. He started a monastry at Parumala, Kerala. Mar Gregorios was a man of God, who lived not according to the way of the flesh but according to the law of god. He led a virtuous and austere life, like a monk, living on frugal diet enriched by prayer and fasting. At Parumala Seminary he led a austere life. He woke up at 4am in the morning and prayed till 5am. He taught deacons till 7am followed by prayer and his lite breakfast. From 9am till 11am he taught deacons again. From 11am to noon he took care of administrative matters and again went to prayer at noon and then to lunch. He rested till 1:30pm and taught till 4pm with a brief prayer in between. From 4pm to 5:30pm he was busy with his administrative duties. After evening prayers and supper he taught bible to the deacons. After the complining, at 9pm he would let the deacons go to bed, but he would still be praying until midnight. On Wednesdays and Fridays and lenten days, he would fast till evening. Besides, he observed his own special fasts. People came from far and near to seek his blessings and paternal advices. In his own words "Prayer brings truth,religious faith, honesty and respect amoung the people." St. Gregorios became sick when he returned from Veeyapuram Church after blessing a marriage. Even from the beginning of his illness he knew that he was in his last days. The news of illness spread all over Malankara. Although he grew weaker day by day, his face shone brighter and brighter. It was on November 2, 1902, midnight he was ready to meet his heavenly father. He left his earthly abode and flew to eternity. In 1947, The Holy Episcopal synod canonised and proclaimed him a Saint of th Orthodox Church. There are hundreds of instances that proved his Saintilness. Thousands of people receive favours and blessings through his intercession. The growing flow of pilgrims to his tomb, several years after his demise, tells a story of a man of faith, prayer, healing, and great intercession. St. Salib (Pi-Stavros) the New Martyr's story is amazing. Thank you for posting it. St. Salib the New Martyr, pray to God for me a sinner. It is an impressive icon of an impressive saint. On this day also of the year 861 A.M. (April 5th, 1145 A.D.) the great and holy father Pope Gabriel II, the seventy Pope of the See of St. Mark, who was known as Ibn Turaik, departed. This Pope was from the nobles of Cairo, and he was a writer, scribe, distinguished scholar, with a commendable conduct. He transcribed with his hand many Arabic and Coptic books, he retained its contents and comprehended its interpretations. The elders of the people and the clergy chose him for the Patriarchal Chair, and his enthronement was on the 9th of Amshir, 847 A.M. (February 3rd., 1131 A.D.). When he prayed his first Divine Liturgy in St. Macarius monastery as the custom of the previous Patriarchs, at the end of the Liturgy, he added to the profession after the saying: 'I believe and confess to the last breath, that this is the life-giving Flesh that Thine Only-Begotten Son, our Lord, God and Savior, Jesus Christ, took from our Lady, the Lady of us all, the holy Mother of God, Saint Mary,' this sentence 'He made it one with His Divinity.' The monks objected, lest it would be understood from that there was mingling between His Divinity and His Humanity, and asked him to refrain from using it. He refused saying: 'This statement was added by a decree from the council of bishops.' After a great and lengthy discussion, they decided to add this sentence: 'Without mingling, without confusion, and without alteration,' because of the fear of falling in the heresy of Eutyches, and he agreed with them. During his papacy, he ordained 53 bishops and many priests, he drew up Canons and laws concerning inheritance, and many other matters. He never took any money from anyone, nor he touched the revenue of the churches, or that of the religious endowments for the poor. When the governor of that time asked him for money, the nobles and people collected three hundred Dinars in gold and gave them to the governor on his behalf. He remained on the Episcopal Chair for fourteen years, two month and two days, then departed in peace. May his prayers be with us and glory be to God forever. Amen. It seems the meaning of the name Ibn Taraik can mean "Son of History" or "Daughter of History" depending on how we are pronouncing the English phonetic 'Ibn'. Thanks for the story it was very interesting. But wouldn't it be "Tareekh" instead of "Turaik" or is that another Arabic word for it? It is hard to write the names in "arabized" English and understand their meaning because some of the letters are not pronounced in English and it can be misleading. The holy Pope Gabriel II last name before ordination is تريك (turek)... and it is irrelevant to تاريخ (taree7') which means history. His dad's name was تريك and it is not nickname for the Pope, and in the culture of the Middle East, whether Arab, Jewish or North African at the time and till now the person is known by his father's name most of the time. There is a very famous egyptian soccer player now called أبو تريكة which is similar to the Pope's dad name. The story of this holy Pope is recorded in the Book"The History of the Coptic Church" by Father Menasah Youhana, pages 406-407, and it talks about his teachings concerning the necessity of adhering to the holy life we are called for specially in the celebrations such as weddings and his efforts to eliminate the bad practices in such ocassions by introducing thirty canons to guide the faithful. We need the same nowadays. In addition to his liturgical interests, the 12th century arab historian Usama Ibn El-Munkes in his book "Lebab EL-adab" documents his phrase which he said to the Sultan "El-3adel Abi EL-7asan" when he asked him to fulfill the request of the king of Ethiopia. The latter asked the Sultan to force the Pope to unlawfully excommunicate the Metropolitan of Ethiopia, who disagreed with the king's practices, in return for many favors. He tortured the Pope when he refused to obey him and kept him in prison for two days, afterwards he summoned him again. The Pope said: " My king, I have no other answer than my previous one concerning His Eminence ... your dominion and power is only on this very weak body which is between your hands, but my faith you cannot alter nor change my conviction. I will not excommunicate him (the Metropolitan of Ethiopia) even if you make me suffer every kind of affliction." Thank you both, and especially Stavro for extra information on the holy father. He is truly axios for his virtues and holiness. May his prayers and blessings be with us all. PS Is there a way where we can have access to these canons in English?